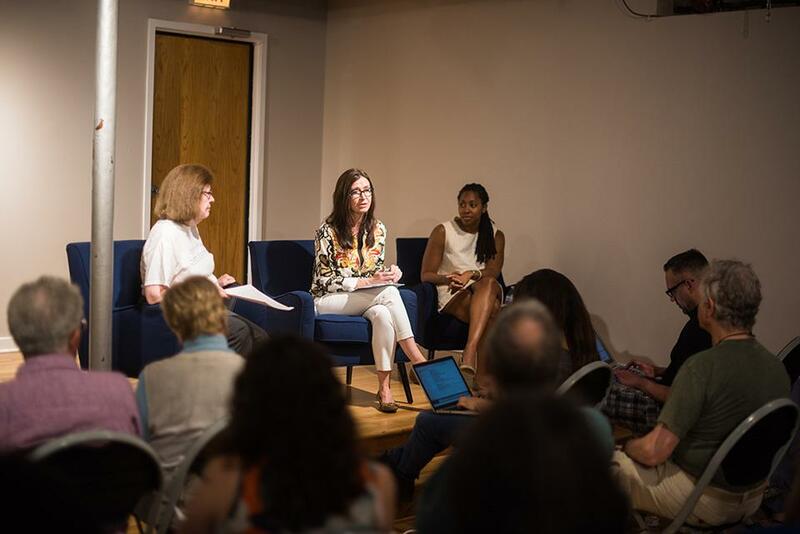 (From left) Gun control activists Eileen Soderstrom, Anna Astalas and Jessyca Dudley discuss community gun security measures during a panel event hosted by Evanston’s chapter of the Peaceable Cities Alliance. Soderstrom and Astalas encouraged audience members to support a bill that would increase gun store regulation measures in Illinois. Gun regulation activists urged Evanston community members Tuesday night to rally around a state bill that would tighten security at gun shops across Illinois. The panelists said the bill, which is scheduled for an amendment hearing in Springfield on Wednesday, calls for an increased number of precautionary measures for gun stores, including background checks, training for dealers and employees, regular inspections and video surveillance systems. It would also require gun stores to not be within 1,000 feet of any school or daycare facility. Two local activists spoke about ways to increase gun control during a panel hosted by Evanston’s chapter of the Peaceable Cities Alliance, a group that also works to prevent gun violence. “We are very fortunate in the approach most of our local legislators take but we need the voices from everywhere,” said Eileen Soderstrom, a board member of People for a Safer Society, a local gun-violence prevention organization. More than 40 people attended the event, which was held at the Gibbs-Morrison Cultural Center, 1823 Church St., and moderated by Jessyca Dudley, a Peaceable Cities board member. Anna Astalas, co-president of the Chicago-area chapter of the Brady Campaign, a nationwide organization that aims to reduce gun violence, said there are thousands of gun dealers in Illinois whose businesses go unregulated. She said it doesn’t make sense that the state requires restaurants, hair salons and other businesses to have valid licenses but fails to enforce the same rules on stores that sell lethal weapons. Any Illinois citizen, Soderstrom said, has the right to go online and file a witness slip in support or opposition against the bill. She said the Illinois Council Against Handgun Violence reported more than 800 people have filed witness slips in support of the legislation, which she said is notable because typically only 30 to 50 people file slips for similar bills. She credited this support to the formation of a coalition of different Illinois groups that stand in favor of gun control. During a Q&A session following the panel, audience members asked the panelists about other gun control measures communities like Evanston can take in order to reduce gun violence. Soderstrom and Astalas both said they support the creation of safe storage policies for fire weapons and encouraged gun education measures as well as stricter child access laws. Some audience members questioned the bill’s efficacy and said more gun regulations wouldn’t fix the problem of violence in communities. Michele Hays, an Evanston resident who attended the event, said there are issues with gun violence in her neighborhood on Evanston’s southeast side, yet during the 15 years she lived there, people didn’t pay enough attention to these crimes. She said it seems like more residents are talking about gun violence as incidents crop up in different areas of the city. “Now that the violence is happening near the high school where all students have to go … everyone is worried about gun violence,” she said.